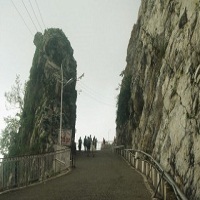 Himkoti is visited by tourists as the sight gives a beautiful view of the entire valley. It is situated at a distance of 2.75 km from Adhkunwari on the new track. The sight does not have any traditional or religious significance but is visited only because of its natural splendour. The Shrine Board has developed a view point and is categorised with restaurants, dosa counters, cooked meal shops, medicare shops and cassette counters. Devotees find this place adequately spacious to rest, relax and enjoy the scenic beauty. There is also an artificial pond, a garden and a meditation centre in Himkoti.